In 1969, the land artists Robert Smithson and Nancy Holt embarked on a lengthy fieldtrip to visit amongst other things ancient ruins and industrial monuments of southern England and Wales, carrying with them textbooks on the Neolithic. As artists, they were ‘fascinated by man’s imprint on the natural landscape’ and this was reflected by the places and monuments they visited, and photographed one another at. Smithson was an American landscape artist, who had an enduring interest in materials and entropy. So it is interesting that he, and Holt, took the time to visit some of the Neolithic dolmen of Pembrokeshire, in SW Wales. Because these are monuments that seem not have decayed, that have defied the ravages of millennia, to look very much like they probably did 5000 years or so ago. Yet something has changed: the context of these monuments. Smithson wrote in his essay Entropy and the New Monuments (1966), “…the urban sprawl, and the infinite number of housing developments of the postwar boom have contributed to the architecture of entropy”. Dolmen have not changed that much, but the landscape has, and in many instances this has impinged on prehistoric archaeology as this blog has been documenting. 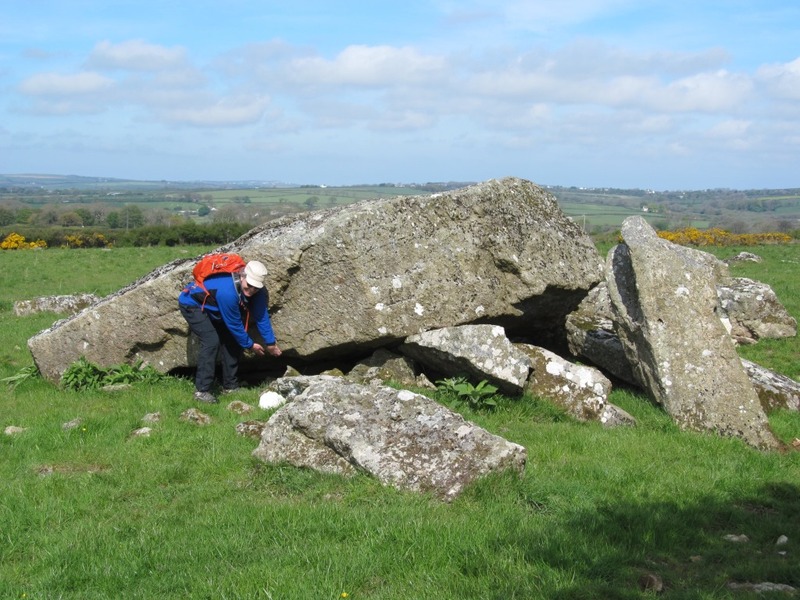 In this post, I would like to recount a recent visit I made in the company of a group of members of the Neolithic Studies Group to a dolmen in Pembrokeshire that has remained constant, even as urbanisation occurred all around it, creating a strange and uncomfortable sensation. 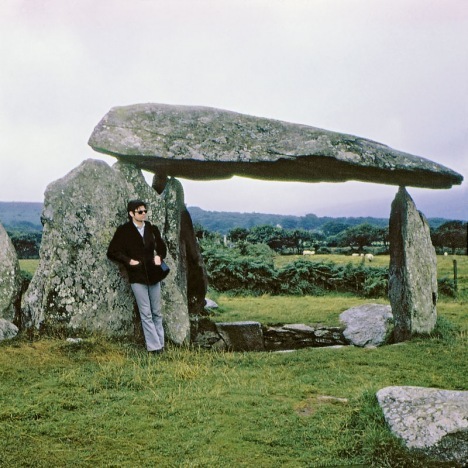 Pembrokeshire has an incredible array of dolmens. These are remarkable and impossible looking collections of large megaliths, characterised by a flat portal slab propped up on several uprights (with several variants identified by archaeologists that I won’t bore you with here). Often, the stones are balanced with a beautiful poise, the capstone apparently floating in the air above the supporting stones, leaving an open void within the centre of the monument. Although previously thought to be the cores of cairns, with the cairn material removed, recent excavations have confirmed that these monuments probably looked rather similar when they were erected in the Neolithic, almost skeletal in appearance. Although excavated examples have been shown to have had a large pit within the central area, perhaps pre-dating the monument or related to monument construction, material directly related to the construction and use of the monuments has rarely been recovered, presumably due to the exposed and open nature of these structures. They may once have been burial monuments, or perhaps served other purposes. 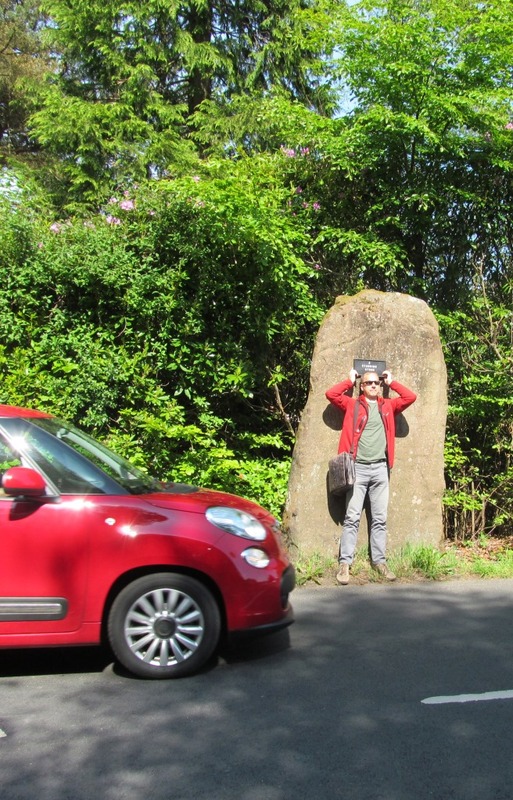 Large slabs may have been propped up to allow them to ‘ring’ when struck with a stone, as has been postulated in the recent Preseli Landscape Perception project. They probably took on a magical appearance for those who encountered them in prehistory. For me they seem to be celebrations of the fabric of the landscape, crazy attempts to prop up huge stones, and lift them up towards the sky after extracting them from the ground. Such dolmens usually stand in the kinds of places that we usually expect to find megaliths – the countryside. They stand in fields, presumably a bit of a pain in the neck for farmers to skirt around with their machinery, or in grassy pasture amidst semi-submerged boulders, or on coastal moorland. As with many megalithic monuments, they typically occur in rocky landscapes with craggy outcrops and mountains. But of course some can be found in urban locations, and when in Pembrokeshire recently, we visited Carreg Coetan Arthur, in Newport (the other, small Newport, not the city near Cardiff), a dolmen in a bungaloid environment, a grassy hole in the centre of a middle class doughnut (apologies for this painful metaphor). This is a dolmen that is well signposted. There is little chance of missing it. These signs represents a trail of bread crumbs, taking the visitor from the main road that runs through the town, to a secondary road. Soon, one encounters a barrage of signs: to the right, as well as the dolmen (‘burial chamber’, rendered in English and Welsh) is a small sign pointing towards a property for sale. To the left lies the Pen-Y-Bont Business Park, where one can find a garage, a carpet shop and a dentist. Turning to the right (as I needed none of the services offered in the business park at that time), in expectation of the sight of the dolmen, I was met with a pole literally covered in signs (and I am using the word literally here in the new official meaning of the word, not the old proper meaning). These are rather unfriendly signs. 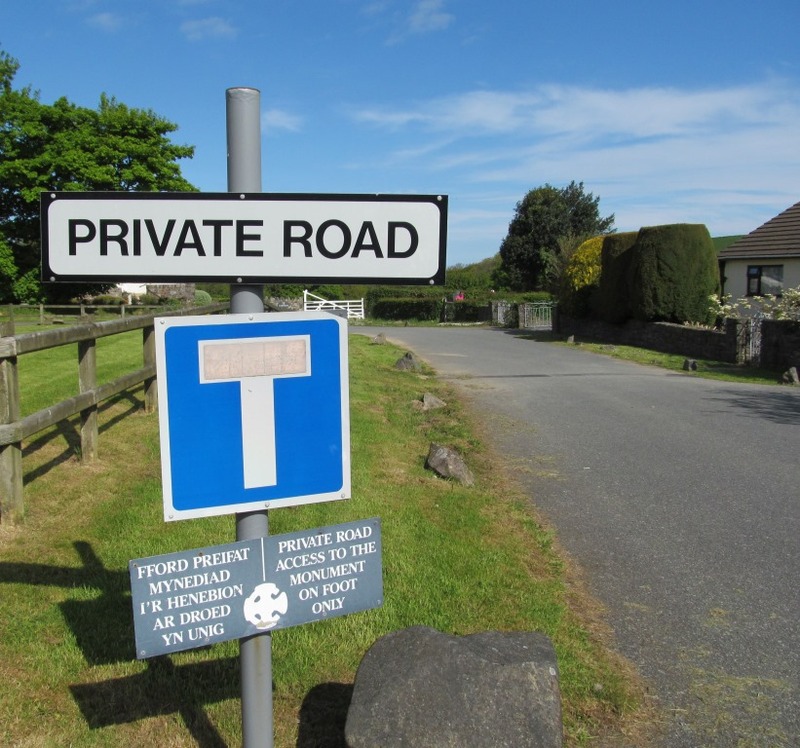 PRIVATE ROAD. PRIVATE ROAD ACCESS TO THE MONUMENT ON FOOT ONLY. A dead end. At the end of this private road, at the dead end, in a bungaloid zone, at last the dolmen was reached, through a gate, in a little rectangle of grass and hedges right next to a house. The dolmen has its own sign, an official grey CADW sign, which made a nice jacket-hanging facility but was short on information for the casual visitor. Grey indeed. As noted above, the site has been excavated and I believe the results will be published soon, so it will be interesting to see some of the detail of when this monument was built and what it was used for. But for me this detail is not as interesting as the physicality and angles of the monument. It is dynamic and yet never moves. 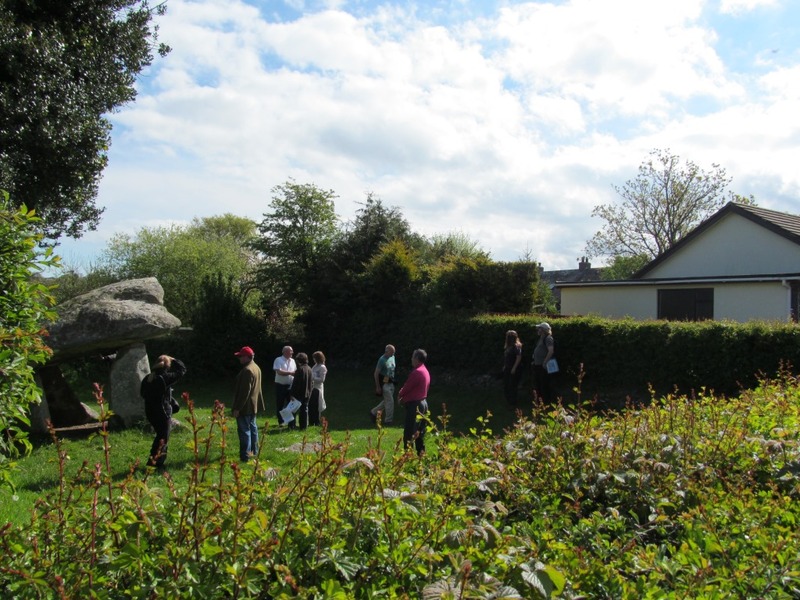 Because the dolmen itself is, of course, wonderful, a bamboozling impossibility, the massive multi-tonne capstone somehow balanced on only two of the portal stones upon which it rises above. The other two orthostats serve no apparent purpose: in both cases, the capstone floats just above their tip, testament to the amazing skills of the monument builders, experts in the properties of stones and their centres of gravity. Even now, I am still not sure how this monument has not fallen down before now. 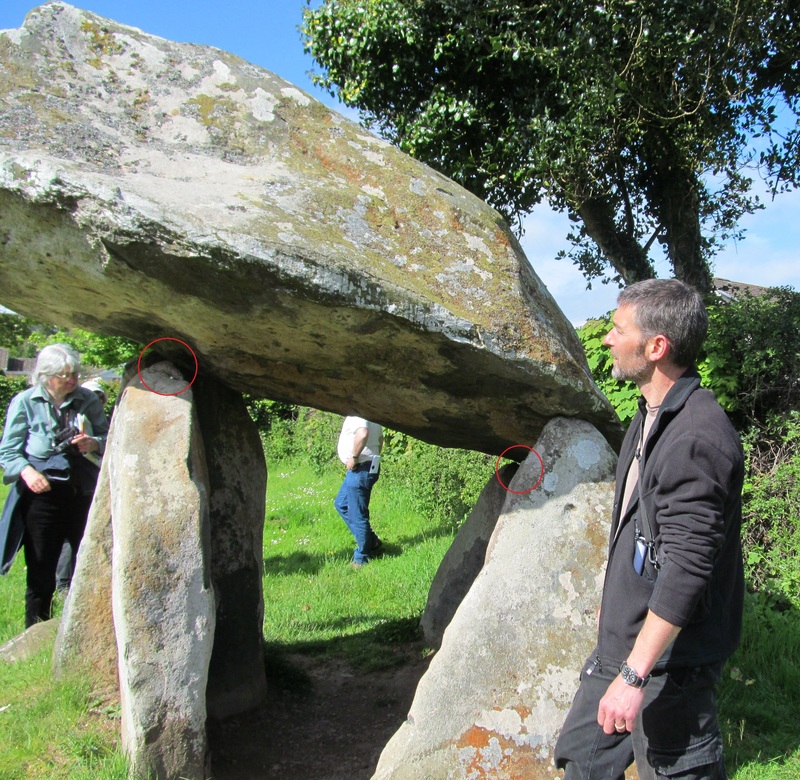 Dolmen appear to have been hollow monuments, to have been open to scrutiny, accessible to spectators. 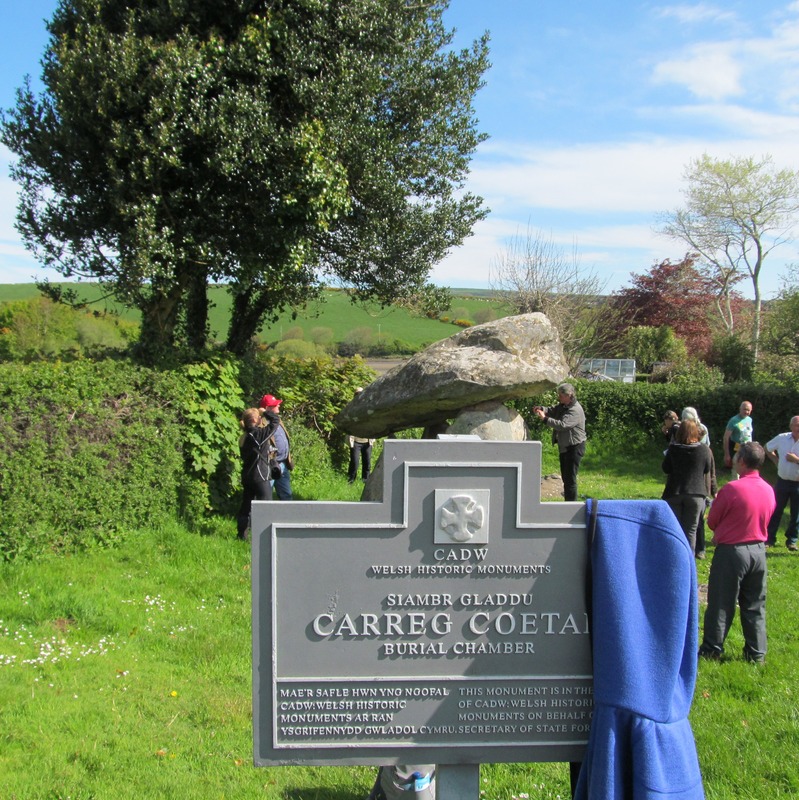 And so it seems appropriate that Carreg Coetan Arthur sits in a location which is open to the gaze of the people who live in the surrounding bungalows. This is not a monument where one could easily partake in antisocial behaviour, unlike some other urban prehistory I have encountered, because this seems almost like a gated community. The dolmen is an affectation, an antiquarian whimsy, a folly, in a glade, sylvan, prettified and under surveillance. When at the monument, we were under surveillance by people in gardens who ‘just happened to be’ pottering about on the lawn just after we arrived. Back in and around Newport, there are echoes of Carreg Coetan Arthur, a source of civic pride and one of the main tourist attractions in the town, afforded its own brown (and grey) signs. 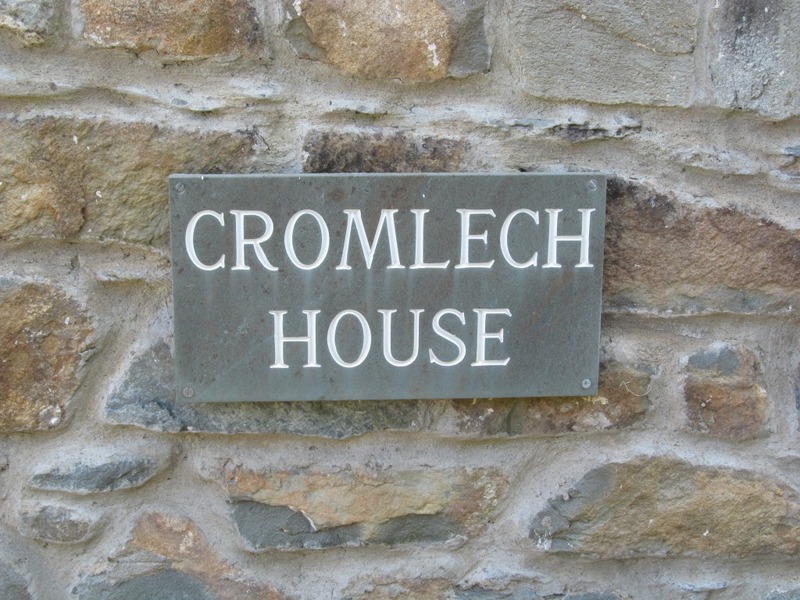 Near the dolmen is Cromlech House. 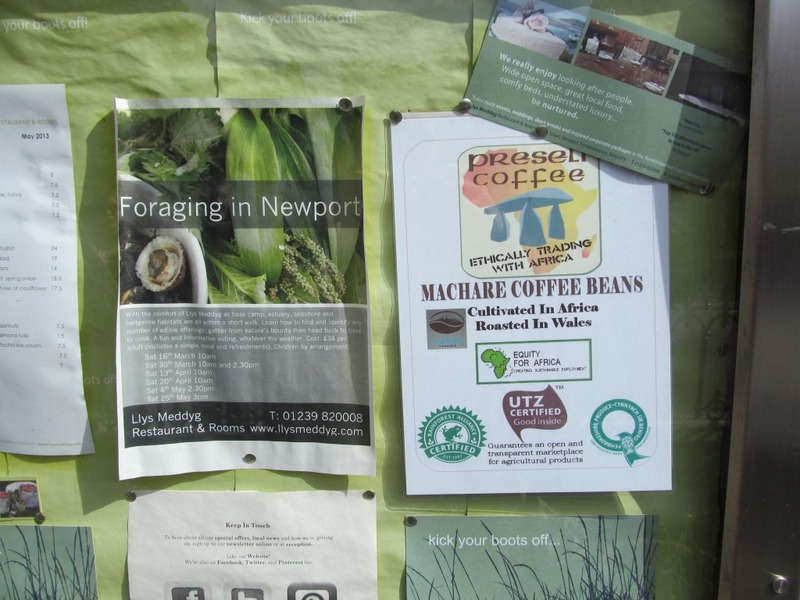 An advert on a noticeboard on the main street advertises Preseli Coffee, which may well be ‘ethically trading with Africa’, but uses a dolmen as a logo, and of course the Preselis are the source of the Stonehenge bluestones. 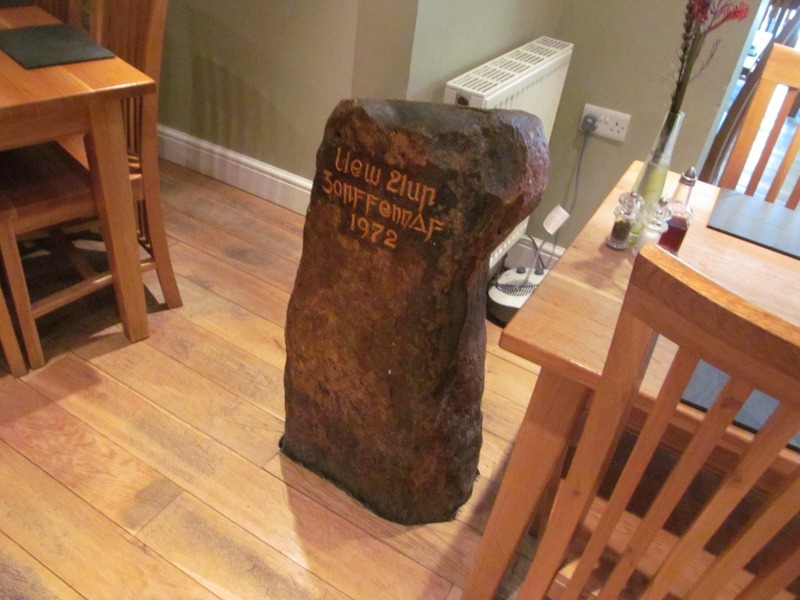 And perhaps strangest of all, in the restaurant of the inn where some of us stayed, The Golden Lion, is a weird thing that is a little like a standing stone of unknown material covered in strange symbols which I was unable to decipher, aside from the year 1972. I have no idea what the significance of this piece of strange furniture is, but it did not put me off the fine breakfasts. My weekend in Pembrokeshire allowed me to visit some fine archaeological sites and walk in some amazing landscapes, but perhaps the strongest memory I took from the trip was the amazing dolmen in a commonplace urban setting. There is a peculiar grandeur to Carreg Coetan Arthur, resilient to the changes going on around it, a constant presence in a landscape of urban development and aesthetic entropy. Private road. Dead end. Perhaps this dolmen was once a dead end, the final resting place for select members of Neolithic society, but now it is a different kind of dead end, a cul-de-sac, the bungaloid dolmen. Sources: Our trip to Pembrokeshire was organised and lead by Meli Mills (although she was Pannett at the time) and thanks to all who accompanied us on that Neolithic Studies Group weekend; much useful and wise information was also imparted by Timothy Darvill. A lot of really exciting work on dolmen has recently been undertaken by Vicki Cummings and Colin Richards, including their excavations at Garn Turne dolmen. My knowledge of these sites in particular comes from unpublished information kindly provided by Vicki. My source for the quote and photo about the Smithson and Holt trip to South Wales was an interview with Nancy Holt, by Simon Grant, published on the Tate website; additional information about Smithson came from the website of his estate where his essay is reproduced in full. The remainder of the photos are my own. 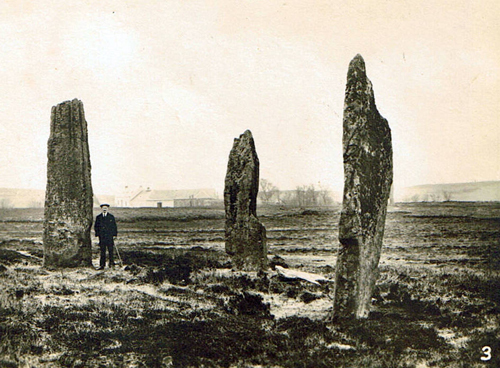 Sometime a place can become defined by its standing stones – Carnac, Salisbury Plain, Orkney – even although that is only ever part of the story. That is because megaliths endure. And megaliths are also malleable, and so we are able to shape them into whatever we want, regardless of the prevailing circumstances. 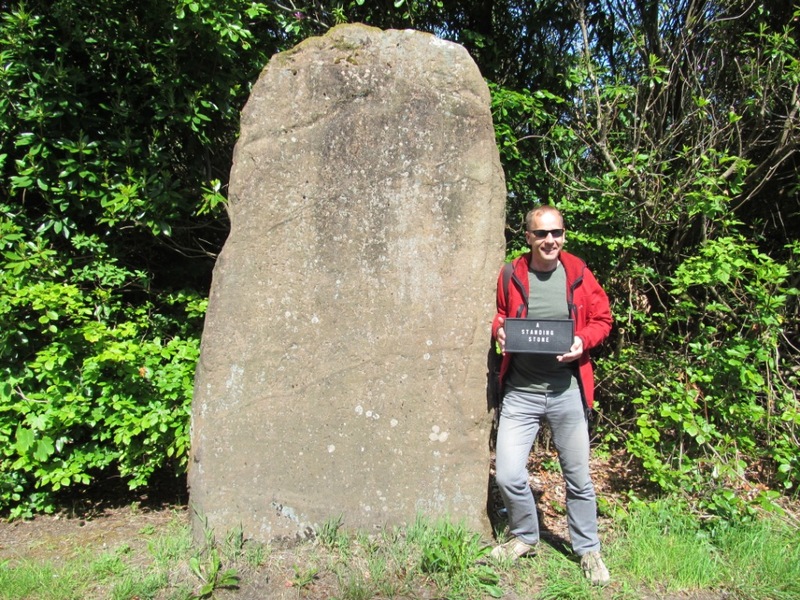 This post is about how this has happened, and is happening, on the island of Arran, in the Firth of Clyde, which has one of the most enigmatic collections of megaliths to be found anywhere in northern Europe at Machrie Moor. This collection of stone circles has layers of meaning, beginning deep beneath the surface, lost in the timelessness of geological time, and running through to the fleeting, disposable times we live in today. 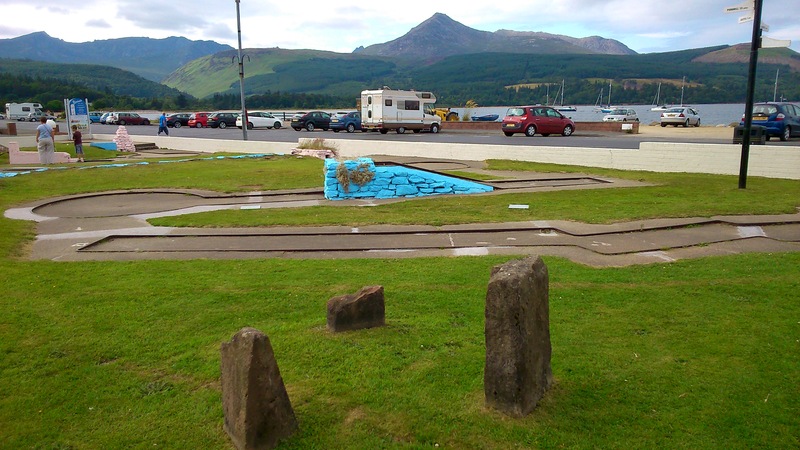 I want to argue that the echoes of megalithic, Neolithic Arran, still persist in Brodick, the island’s capital town, today, sometimes in quite surprising ways. Prehistoric monuments often leave some kind of trace behind them, but what form the trace takes is not always predictable … or even logical. We need to start at the beginning, Machrie Moor. This amazing landscape (the terms monument or site hardly do it justice) in moorland just north of Blackwaterfoot on the west coast of Arran consists of at least six stone circles, as well as assorted burial monuments, and traces of later farming activity abounds as well. The stone circles are a spectacular example of the way that monuments can reflect and embody the land from which the stone was sourced. The circles consist of tall, majestic and eroding sandstone pillars, but also squatter, rounder grey-white granite boulders. Some circles utilise both stone types, others are restricted to one or the other. As Andrew M Jones has noted, the materiality of these stones – their geology, texture and colour – are representative of the island of Arran itself. He wrote in 1997: ‘The island is divided into two distinct geological zones – a barren, northern mountainous region of white granites and schist, and a fertile southern lowland region of red sandstone’. Bearing this in mind, Jones argued of the bi-colour scheme at Machrie Moor that…’it may be that white and red also symbolised the land itself, the white of the north and the red of the south’. I love this imagery, the sensory properties of standing stones representing the land from which the stones were sourced, embodying the stones with magical and mundane powers. 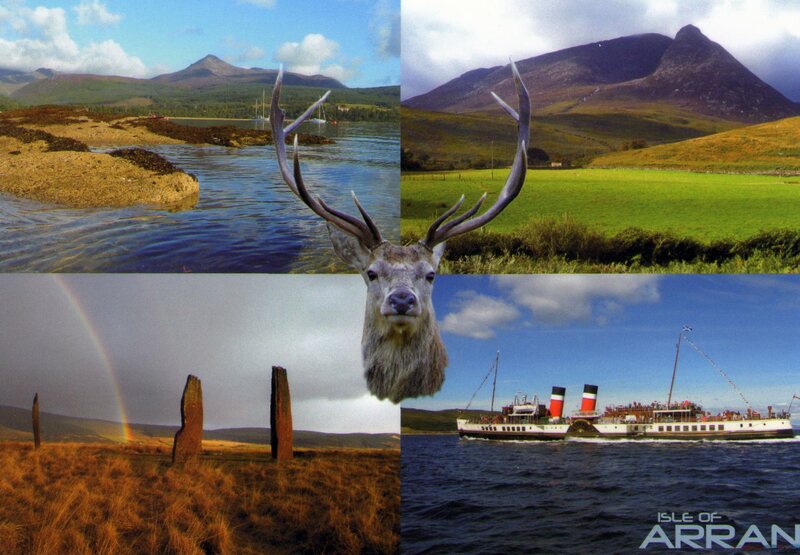 Arran is often referred to as ‘Scotland in miniature’, and so it seems that Machrie Moor is Arran in miniature. 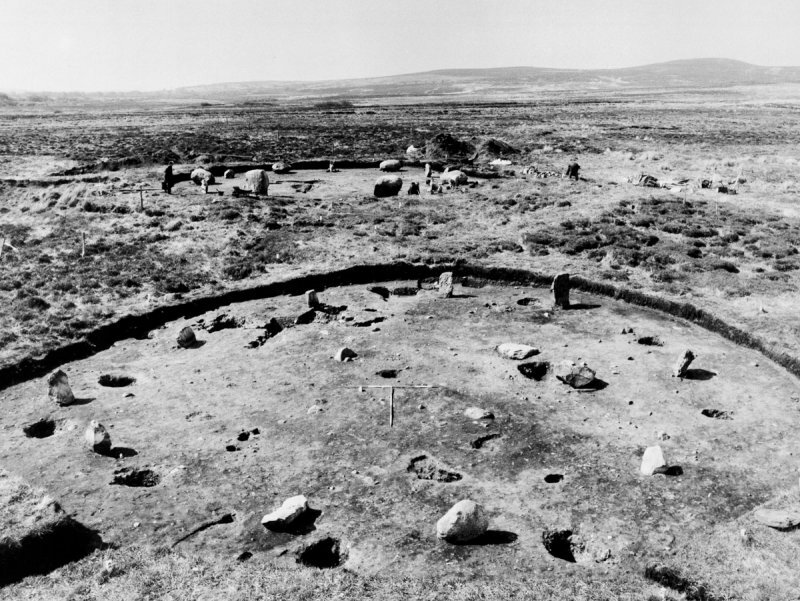 There have been some episodes of modern excavation at Machrie Moor, in 1978 and 1979 under the direction of Aubrey Burl, and then again by Alison Haggarty in the mid-1980s: both explored circles 1 and 11 (the latter being buried by peat and vegetation at the time). The excavations revealed a remarkable sequence of activity in the Neolithic and Bronze Age, which culminated in the stone circles. Preceding them were episodes of timber monument construction, as well as a phase of ploughing, and also some pit digging. Clearly, these were locations that had a strong sense of place from at least the time of the first farmers, and like so many prehistoric sacred places, they endured, for many many generations, even when little was there so mark them out as special. The resilience of these places to the rigour of time and the failing of human memories is amazing, and shows no sign of stopping now. 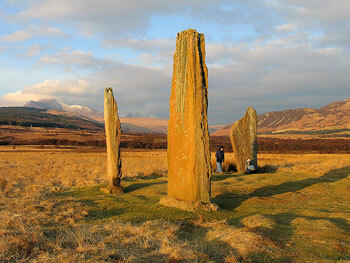 Because of course the standing stones of Machrie Moor still matter to the people who live on Arran today. There are many signs that the island is marketed to tourists and visitors via the heritage resource that is Machrie Moor, from the ubiquitous postcards, usually showing the kinaesthetic and dramatic salmon-coloured sandstone pillars, through marketing material and even product branding. Examples of this is include the use of sandstone standing stones on the labelling of the Isle of Arran 10 year old and 14 year old single malt whisky, and also on the Arran dark beer, brewed on the island. These high profile, international brands, have utilised the dramatic megaliths as a synecdoche of (as well as metaphor for) the island of Arran itself. Of course, this kind of utilisation of the past in the present is commonplace in the vicinity of other important and famous archaeological sites, with brands, businesses and street names reflecting famous forts, stone circles or Roman walls. For me, these suggests one kind of lingering significance of megaliths in the modern landscape and consciousness, what could be termed a form of remanence. Stephen Dobson and Paul Selman have recently (2012) written about ‘landscape remanence’ in connection with historic landscapes. They note that remanence is a ‘term borrowed from physics to reflect the tendency of a faint impression to linger even after the processes that caused the original effect have disappeared’, the most obvious examples being a magnetic field. I have written before about our expectation in some contexts that places have essences, faint traces of something that happened before encoded within them, although in the case of landscapes, this effect can become more diffuse. And so in Brodick (on the opposite side of the island to Machrie), I found a number of allusions, both ancient and modern, to the Machrie Moor circles. ‘Located in front of the main shop and café, the fifteen holes provide endless fun for all ages. The tiny standing stones of course are Machrie Moor in miniature, and Machrie Moor is Arran in miniature, and Arran is Scotland in miniature. Makes sense. Of course there are other echoes in Brodick as well, such as an imposing sandstone standing stone at the roadside on the northern side of the town, across from a primary school. This massive slab often has bins set out beside it, and at its base on a visit in June I noticed the debris of some kind of road incident, some broken glass and bent plastic. Cars fly past and make the stone difficult to photograph from the optimum position in the middle of the road. 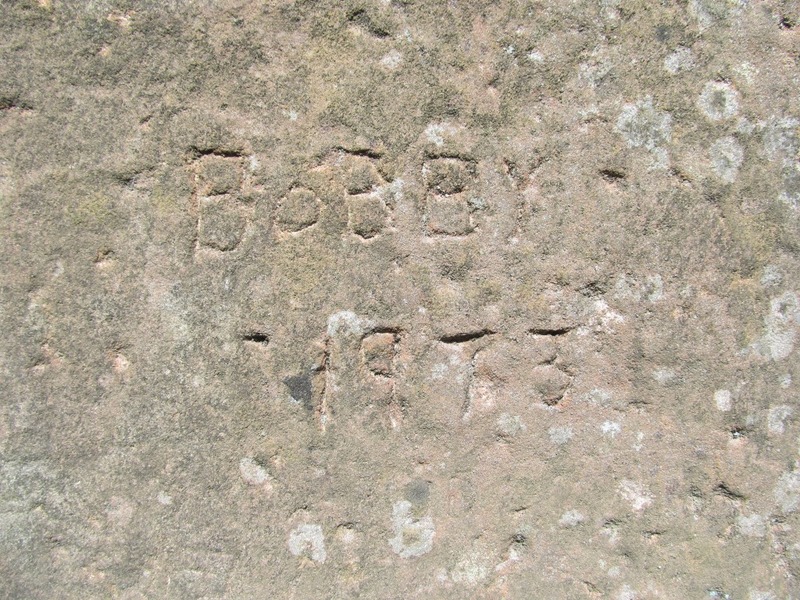 Carved on the stone are the words ‘Bobby 1973’. Horace Fairhurst, in his book Exploring Arran’s Past, tells the visitor to the island that this standing stone is a ‘remarkable specimen’ of its type. Yet almost nothing is known of this standing stone, although it obviously is physically reminiscent of some of the stones at Machrie Moor, and it may well have brought this association to mind in prehistory as well. The stone is known as the Stronach standing stone (National Monuments Record of Scotland number NS03NW 5) and is 2.4m high, 1.8m broad and 0.6m thick – in other words, it is a solid unit. 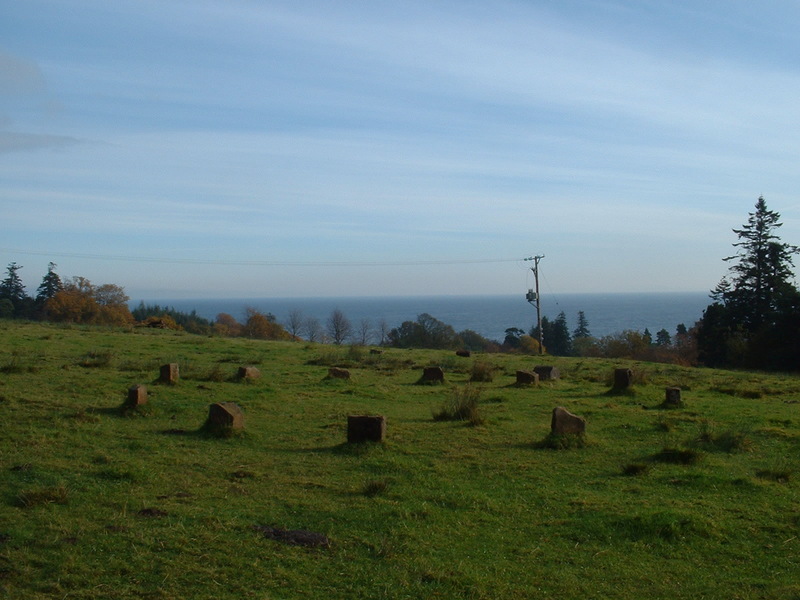 Other echoes of Machrie Moor exist elsewhere near Brodick, for instance with a number of standing stones within the grounds of Brodick Castle. And in the 1990s, a strange modern tribute to Machrie was constructed by the National Trust for Scotland – a circle of standing stones in a field just behind Brodick Castle. 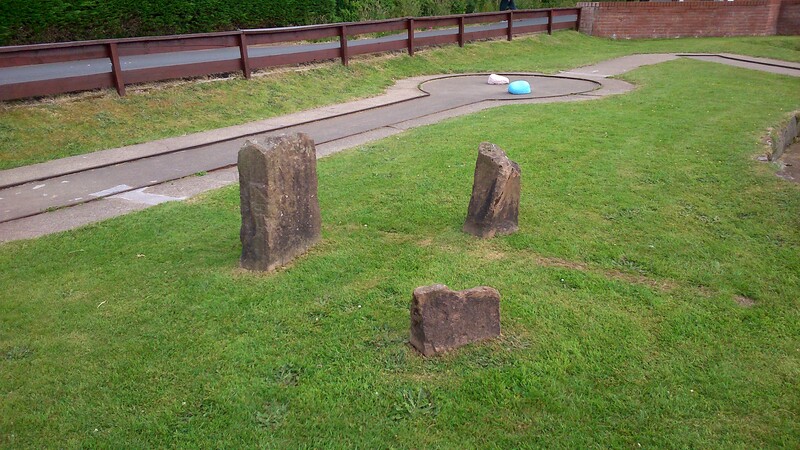 This bizarre stone circle consisted of ten squat sandstone slabs set in small circle: the photo above was taken in 2004, but soon after, the circle appears to have been dismantled and is now nowhere to be seen. Almost nothing is known, or remembered of this circle, even although it stood less than a decade ago, suggesting it was not as resilient a place as Machrie Moor itself…or folk memory is not what it once was. 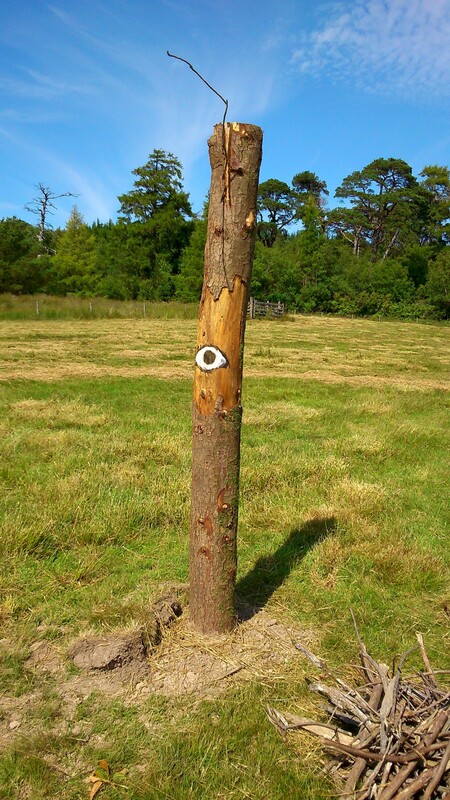 A still more temporary tribute to Machrie Moor was constructed in the ground of Brodick Castle in July this year – although this time, the echo was of one of the timber circles, not a stone circle or megalith. The Burning the Circle event was a collaboration between the National Trust for Scotland, Northlight Heritage and the University of Glasgow, and involved a weekend of prehistoric activities and crafts, as well as the construction of a timber circle – as the publicity stated, this was the first such monument constructed on Arran for 4000 years! One of the reasons for carrying out the timber circle ‘experiment’ was to explore exactly how monuments retained significance in folk memory for so long in prehistory: what was it that encouraged remanence, that promoted resilience, that helped memories to be curated? In the case of timber monuments, Gordon Noble has suggested (in his 2006 book Neolithic Scotland: timber, stone, earth and fire) that one such means to do this was through dramatic events that caused ‘flashbulb memories’. Such an event could be a fire, and we have evidence that many Neolithic timber monuments were burnt down (although this is not as common for timber circles as other, earlier timber structures). Building the timber circle created one set of memories, but burning down the timber circle was altogether more dramatic and memorable. We set the timbers alight after dark one sunny July evening, and the resultant fires were visible from Brodick itself. In this case, we created memories by destroying something: memories are much more resilient than wood. Megaliths were not burnt down, but unlike timber, which is temporary and vulnerable, stone creates its own memories, a permanent memorial to itself. While the timber circles at Machrie Moor were eventually replaced by stone ones, the stone circles endured, and for all we know, they may endure forever. Currently Arran is marketing itself with the slogan ‘Island time…in no time’, and this reflects the timeless qualities of Machrie that persist in both rural and urban contexts. This is because the special place that was and is Machrie Moor has remanence – even today in 2013, in the world of marketing and commercialisation, tourism and cars, the faint impression of the Machrie megaliths lingers still. Sources: The idea of remanence as applied to historic landscapes was inspired by Dobson and Selman’s 2012 article ‘Applying Historic Landscape Characterization in Spatial Planning: from remnants to remanence’, from the journal Planning Practice and Research (pages 1-16) and its application to urban prehistory first suggested to me by Helen Green. Andrew Jones’s quotation comes from a short article he wrote for British Archaeology magazine (March 1997, page 6) entitled ‘On the earth colours of Neolithic death’ and he also published an in-depth article developing his theme in volume 18.4 of the Oxford Journal of Archaeology (1999). Burl’s excavations were written up by Alison Haggarty, in the 1991 edition of the Proceedings of the Society of Antiquaries of Scotland (volume 121, pages 51-94). The image of the Isle of Arran whisky came from the distillery website and the beer bottle image came from the brewery website, while the old photo of Machrie Moor (a postcard I think) came from the Machrie Bay golf course website, which has lots of amazing old photos of the area. The mini golf image came from the Bilslands website while the Machrie excavation photo was sourced from CANMORE and dates to the 1985 excavations. The colour Machrie stone circle photo came from an Argyll walking webpage as I didn’t have time to scan any of my old slides! I would like to thank everyone who worked on the Burning the Circle project, especially Corinna and Gavin, and thanks Gavin for the photo of the Brodick Castle stone circle. 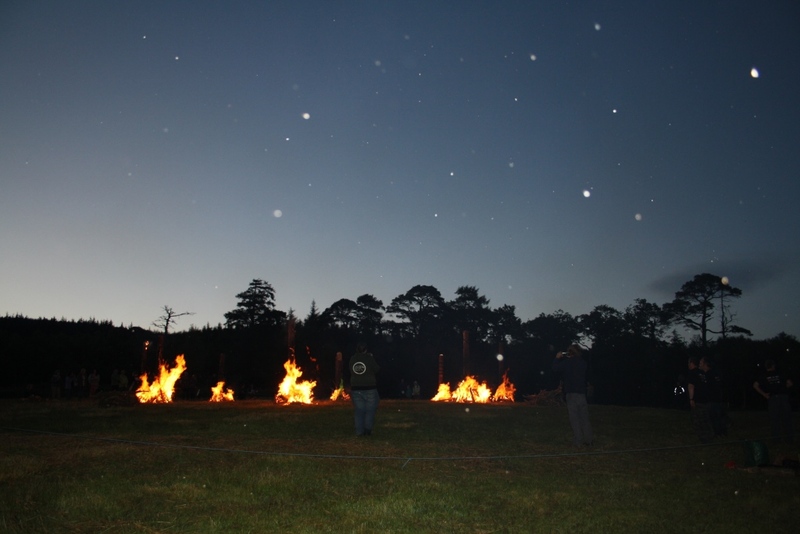 For more information and great photos of Burning the Circle, see the Northlight Heritage Facebook site (the source of the wonderful Burning the Circle logo, designed by Ingrid Shearer).